The American Customer Satisfaction Index, released today, found that the percentage of users satisfied by T-Mobile’s service rose 6% in year-over-year terms to 74%, while the wireless service provider industry as a whole saw a 1.4% improvement, to 71%. The only named provider to lose ground was TracFone, which dropped to 75% from 77% in 2015, though that still makes it the highest-rated in the category. As wireless providers increasingly compete on price, the general experience of using mobile service providers has improved slightly, the ACSI said. 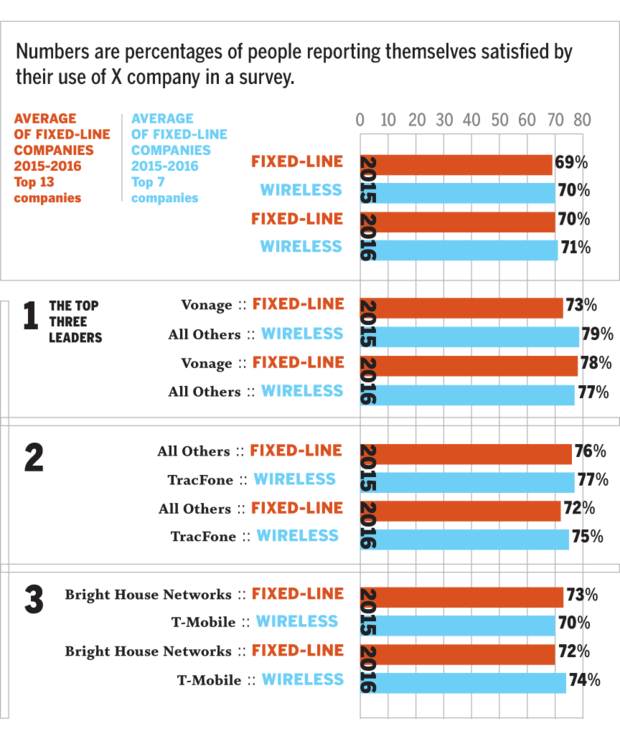 Customers rate network coverage, call quality, connection reliability and their satisfaction with the variety of available plans more highly than they did last year, according to the report. In the wired half of the service provider industry, however, the outlook remained grim – wired ISPs had the least satisfied customers of any of the 43 market segments tracked by the ACSI, at just 64% overall. Perennially unpopular Comcast actually gained 5%, however, reaching 59% satisfaction, while Frontier Communications slid into the bottom spot at 56%. The best of the market segment was Verizon FiOS, at 73%. Wired ISPs remain unpopular because they’re a major obstacle to online cord-cutting, according to the ACSI report. And since they’re often pay TV providers themselves, there’s an obvious incentive to make cord-cutting as difficult as possible. “Pay TV cord cutters still rely on ISPs to provide the high-speed connectivity required for OTT services like Netflix and Amazon Prime Video,” the report notes, adding that data caps can affect customer satisfaction for such users.